PC Power Management is fast emerging as one of the quickest and most effective ways to achieve sustainability outcomes, cut energy costs, and manage PC power consumption. 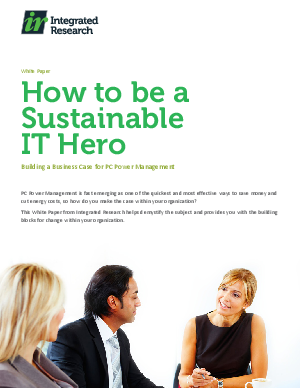 The White Paper from Integrated Research, "How to be a Sustainable IT Hero: Building a Business Case for PC Power Management" will help you present a fact-based, solid business case to explain the need for PC Power Management within your organization. It also identifies some of the common pitfalls along the way. Every business case has to stand up to a sanity test and you may need to defend it to those stakeholders who would prefer to do nothing or prioritize other initiatives. However, if you can accurately project the amount of money that can be saved year on year, your case will be much stronger. According to Gartner, a non-disruptive PC power management policy can save you between 20-30 (USD), 12-18 (GB Pounds), or 15-22 (EUR) every year per PC, and be self-funding within the first year of deployment. Other sources have suggested that savings could be much higher. These savings will increase as energy costs rise. To prove the value of PC Power Management in terms of cost reduction you can either rely on these independent reports or you can do your own calculations by taking the following points into consideration: (a) current user behavior (b) power utilization of PCs at idle and (c) cost of your electricity in power-down window. In addition to the energy cost savings, the key elements to consider in building a PC Power Management business case include carbon reduction, corporate social responsibility, software, infrastructure, and staff time. To promote change quickly and effectively within your organization there are some common pitfalls you need to avoid. For example, many vendors provide ROI calculators which aim to show how much you could save if you buy their software. While useful on the one hand, this is problematic on the other because they often make undocumented, simplified assumptions that lead to inflated predictions of savings. The use of quick to deploy agent-less power management software allows you to accurately assess the cost of current staff behavior within the context of a software trial. Ultimately, there are many benefits to be gained from implementing PC Power Management within your organization. As electricity costs increase, the reduction in power usage will undoubtedly affect the energy bill. Your organization's carbon footprint will be reduced and there are also the broader benefits of implementing a corporate social responsibility policy in your organization. Perhaps most compelling of all is the fact that with a reputable PC Power Management solution in place, these benefits are easy to quantify and report on. To find out more about the benefits implementing PC Power Management within your organization and to download a free license, visit www.powerminder.com.